Uganda's President Yoweri Museveni has said he will crush Somalia's al-Shabab over Sunday's deadly Kampala blasts which killed 74 people. He said he wanted to send up to 20,000 troops to Somalia to "eliminate" the hardline Islamist group. Al-Shabab has said it was behind the twin attacks on people watching the World Cup final because Ugandan troops are supporting the Somali government. Mr Museveni said other countries would now send troops to Mogadishu. "I am optimistic that these numbers will be raised now - especially now - because these people have provoked the world more than before. And I can assure you they have invited a lot of problems for themselves," he told journalists in Uganda. The regional grouping Igad last week promised to send an extra 2,000 peacekeepers to the African Union Mission in Somalia, Amisom, which currently has 5,000 troops protecting the UN-backed government. But Mr Museveni said he wanted their mandate to be changed. "We were just in Mogadishu to guard the airport and the presidential palace - that was all," he said. "We are going to go on the offensive and go for all who did this in all areas, starting here." Al-Shabab controls much of southern and central Somalia, while the government's writ only runs in parts of Mogadishu. BBC East Africa correspondent Will Ross says this was typical language from President Museveni, whose reliance on military options has in the past been criticised. Our reporter says some Ugandans will now question the wisdom of becoming further embroiled in the Somali conflict. Some opposition politicians have said the country should withdraw - an option strongly rejected by the government. Burundi, the only other country to have contributed to the AU force, has also said it will keep its troops in Somalia. 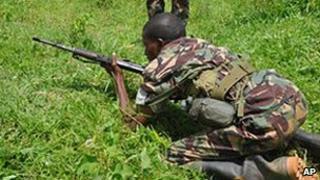 But it has stepped up security, as has Kenya, which is training Somali government forces. Kampala is due to host an African Union summit next week, which Mr Museveni says will go ahead as planned. The UN has agreed in principle to take over the peacekeeping mission in Somalia but has declined to set a date. Many countries are wary of sending troops to lawless Somalia, which has been in a state of anarchy for two decades. On Wednesday, US officials accused al-Shabab of being racist and not respecting the lives of Africans. Six people have been arrested over the blasts, the AFP news agency quotes a police spokeswoman as saying. AFP also quotes a minister as confirming that at least one of the blasts was caused by a suicide bomber.